Submerging yourself in the board gaming hobby can be daunting – where do you begin? How do I know what kinds of games I’ll like? What is Board Game Geek?! There are so many games out there. Seriously, there are a TON. There’s no way that you’re going to be able to try them all, so you want to be sure that the time you’re investing is going to be worth your while. Luckily, most games are simply reimagined or reinvented uses of existing mechanics. Once you find a set of mechanics that calls your name, you can easily find other games in the same arena that you’re more likely to enjoy! In this series of articles, I’m going to showcase a set of similar games that fall into the same category. Starting with the least complex, we’re going to gradually sprinkle in some additional mechanics and eventually end at a game that initially SEEMS complicated. Further inspection, however, will reveal that you’re already familiar with the majority of the gameplay through the other games listed before it. First up on the docket are role-based cooperative games. These are games where everyone at the table is working together to achieve a goal before certain failure conditions are met. Either everyone wins, or everyone loses, which makes it a great entry point into the gaming hobby. Starting with the ever-sinking sands of Forbidden Island, we’ll heat things up with Flash Point: Fire Rescue before testing our world-saving skills with Pandemic. Forbidden Island takes a group of treasure-hunters to a mystical island in an attempt to recover four long-lost artifacts of immense value. Using their unique talents, the adventurers must secure the relics before the entire island is swallowed by the sea. As the game progresses, the island will begin sinking. It’s up to the players to keep the water at bay; if access to a relic is lost before the team acquires it, then it’s game over. What really makes this game great, however, are the various role cards. At the beginning of the game, each player gets assigned a role, granting them an extra level of utility. One player might be incredibly mobile while another might be exceptionally skilled at keeping the island tiles from submerging. These unique roles allow players to embrace their position within the team. You’ll find your table suggesting actions and strategizing optimal movements on the way to victory. More experienced players can help newer players by offering input but ultimately letting each player decide their actions on their own. Forbidden Island offers tension in droves; as you get down to the wire and the flood counter is slowly ticking upwards, each turn feels more important than the last. And when you finally signal the helicopter to come extract your team, it’s fun to see what might have happened on the following turn! As players flip through the Flood deck, sometimes you’ll encounter the dreaded ‘Waters Rise’ cards. These are BAD. When drawn, the flood counter advances towards failure and several tiles become flooded. This is an important mechanic that creates the tension between each turn. Once you get the hang of the base game, you can increase the difficulty through the arrangement of the location tiles or the starting flood level. Additionally, there are other variations of the game in the Forbidden series that you can check out. (Get the game here for under $20.) Each one offers a new take on the same concept. If you’re ready to branch out, however, it’s time to raise the temperature! In Flash Point: Fire Rescue we are shifting gears from actively avoiding water (like we did on the Forbidden Island), to wholly-embracing the extinguishing characteristics of water. Players assume the roles of a brave fire rescue team whose goal is to save the victims from a raging fire before the flames get out of control and before the building collapses. Each player will take turns navigating through the hazards to locate Points of Interest, hoping to find victims that they can carry to safety. While this is happening, smoke and flames are steadily spreading through the building, threatening the lives of everyone inside. Things are going to get a little more complicated from here, but let’s see which mechanics carry over from Forbidden Island and you’ll see that the complexity is an illusion! 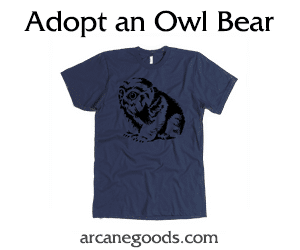 Specific player roles – Check! Limited set of player actions – Check! Cooperative game with multiple failure conditions – Check! Chopping walls to create additional paths of movement. 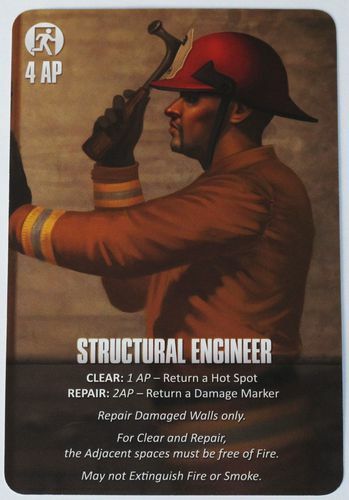 The other main mechanical addition in Flash Point: Fire Rescue is the use of a spreading mechanic. I also refer to this as a ‘living adversary’ because the gamestate is constantly changing based on its previous state. What I mean by this is that the Fire and Smoke are constantly spreading, but their behavior is semi-predictable. You know that areas already affected by Fire are prone to explosions, and the smoky areas will turn to Fire. Players can use this knowledge to strategize and try to mitigate damages before they happen. It creates a sense of overwhelming dread and forces players to use their actions to react to the ever-changing board. Since there’s already a ton of mechanics that you already know, since you’ve played Forbidden Island, it really makes the learning process easier. You’re just tacking on a couple pieces as you continue assembling your Voltron-esque gaming knowledge! Just like Forbidden Island, there are multiple ways to increase the difficulty and complexity of Flash Point: Fire Rescue. You can add in vehicles and additional actions or hazards to really challenge yourselves in your rescue skills. There are several great expansions to enhance your game and push yourself to the limit. Get the game here. Once you’ve successfully extinguished enough fires, however, you may want to move on to an even more complicated role-based cooperative game: Pandemic. There’s been an outbreak! The entire WORLD is affected! 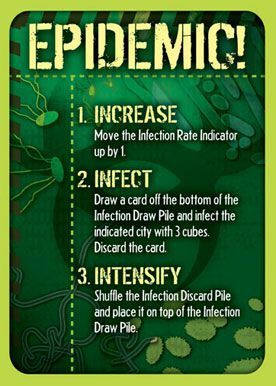 In Pandemic, you’ll be putting on your rubber gloves in an attempt to contain, cure, and eradicate the diseases plaguing humanity. Four diseases are spreading through cities while the players rush around the map trying to simultaneously find a cure and treat the disease. Similar to the other two games, infections happen between each player’s turn. During the Infection stage, there is the potential for an Outbreak to occur, which can cause a chain-reaction of infections. The game is all about prioritizing the most problematic areas and juggling multiple objectives against a severe time crunch. It’s one of the best thematic games that really makes you feel dread and worry as the diseases spread. You truly feel like you’re an entire world away from the rest of your team at times! Again, don’t be daunted by the larger rulebook and pieces. Even though the game has more moving pieces than the other two we’ve learned about, it’s very similar at its base level. Just like before, here are the main mechanics that we’ve learned about; which ones are reused in Pandemic? You see? Fairly similar! Basically, Pandemic is taking the existing mechanics and compounding them to create more tension and difficulty. For example, players are collecting sets of matching colors in order to cure diseases. At the same time, however, players need to collect cards to build research stations in strategic locations AND they may need to use cards to travel quickly across the board. By doubling up on the set collection mechanic, players must thoroughly weigh their options and think ahead at the possible ramifications of giving up a specific card. Additionally, complexity is added by having four separate diseases spreading simultaneously. Instead of fighting a single figurative fire, players must concentrate their efforts on multiple fronts. I don’t consider this to be a new mechanic, but it does change the game enough to ratchet the difficulty up a notch or two. Other than that, Pandemic really only offers a ‘building’ action to set it apart from the other role-playing cooperative games that we’ve previously discussed. This mechanic functionally adds a minor roadblock towards completing an objective. In Forbidden Island, for example, players have to get to one of the two specific tiles to trade-in their cards for a treasure. Pandemic allows players to cash in their cards at any space that they’ve already built a research station, which offers more flexibility but additional resources compared to the former. Get the game here. If you’re looking for even more Pandemic action, be sure to check out Pandemic: Legacy. This version uses the familiar theme and mechanics in a legacy version. This allows you and your group to play out an overarching story through multiple sessions of play. Over time, the game evolves with new rules and mechanics, offering a truly unique experience for Pandemic-lovers everywhere. When you break games down in this way, it becomes much easier to see how the industry tends to repeat itself by using recognizable mechanics. All you have to do is associate mechanics with ones you’ve already become familiar with and new games become much more manageable. Don’t feel like you HAVE to play these games in this order to get the most out of them; I’m just trying to recommend a good sequence that slowly builds up a foundation of knowledge for role-based cooperative games. If any of these really jump out and interest you, go for it! And you know what’s really great? These games are becoming more mainstream, meaning that you should be able to find them without much trouble. Check with your local game store! It’s also really awesome seeing some of these games line the shelves of other retailers, since it means the hobby is growing in a positive way. Well, that’s all for now! I’ve got treasures to collect, fires to extinguish, and an epidemic to cure. And the only prescription…is more gaming!